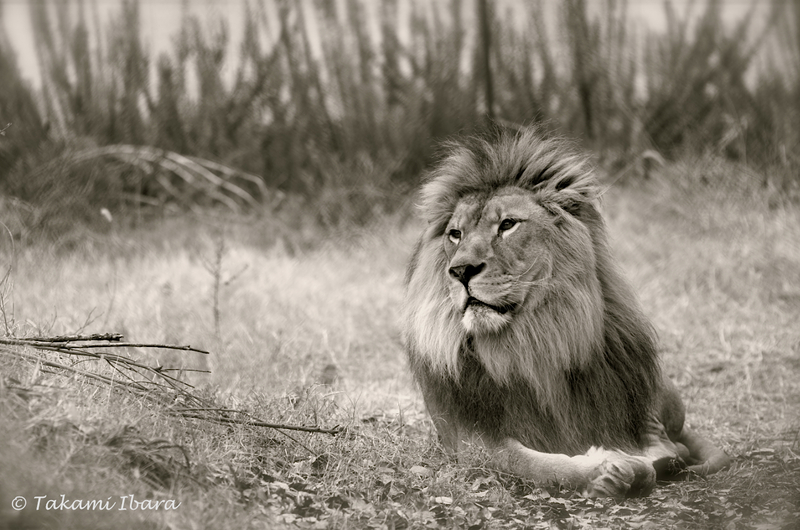 This entry was posted in Animals & Zoos (動物と動物園), B&W Photography (モノクロ写真), Photography (写真) and tagged african lions, animals, モノクロ写真, ライオン, b&w photography, lions, 動物 by T Ibara Photo. Bookmark the permalink. Magnificent, Takami!I find this photo very moving. Utterly majestic. Great picture, thank you for posting it. Beautiful dreamer, Takami. This picture is a perfect illustration of his wish for his vast savannah. I hope to see the King live tomorrow, if I’m lucky. Greetings from Nairobi. That’s a beautiful image. I do really like animals but scared of wild ones. Such a beautiful animal! You captured a perfect moment, a story. Very regal animal… I think my cat Pharoah is related! This is a majestic photo of a King dreaming of his homeland ~ a perfect title. You’ve captured his spirit so well. Wishing you a great day Takami. Thank you Randall! It’s always great to receive feedback. I realise that the titles we choose for photographs are very important, in that they can affect how the viewer sees the photo. I take care to come up with appropriate titles for my photos. Sometimes, it’s more challenging than taking the photo itself 😀 I’m happy this majestic lion is receiving such a positive response. My small contribution to him. Fabulous photo of an incredibly beautiful lion! Wow! That is such a beautiful photograph! Thank you Bob, for stopping by and commenting. Beautiful Takami, and the title is so appropriate! Thank you! It was a special moment. Love this photo, Takami! Of course, I love lions, lol. But this is a great photo with so much life and personality, and I think the sepia tones are wonderful and bring out the rich dignity of the animal. Beautiful. It’s a treat — it’s such a beautiful photograph. I would certainly love to know what he’s thinking about. A truly beautiful animal, and a wonderful capture Takami. Thank-you for sharing this. Very nice picture, dear Takami. He really is a beauty. O wow! Looks as if you were in Africa! This lion IS reminiscing! Fantastic photograph! I love his pose. Great one! I like your choice of black and white, and the depth of field. Even his lean toward the center makes it all work! majestic and elegant beauty, great shot, ibara-san, bravo! with pleasure, ibara-san. all the best to you and yours too, i do look forward to hearing your comments too :). have a good weekend. Nice kitty, be nice kitty!